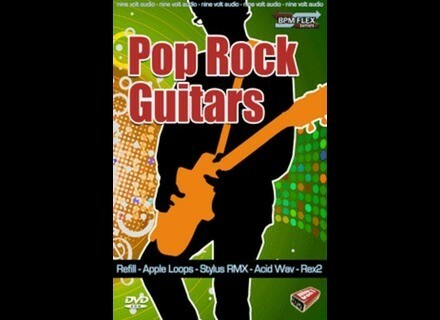 Pop Rock Guitars, Guitar Sample from Nine Volt Audio. As part of the BPM Flex Series, Pop Rock Guitars is designed to allow every REX-based loop to be used at a range of tempos with no artificial stretching. 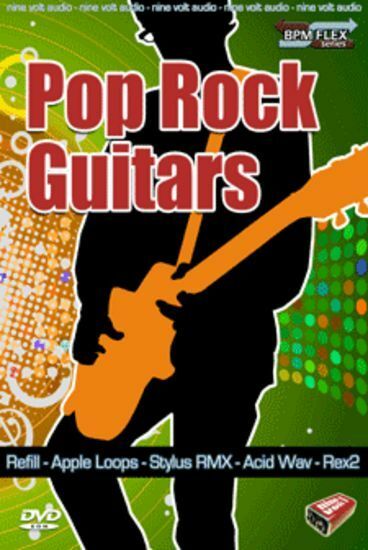 Pop Rock Guitars presents nearly 1000 files for each format: REX2, Stylus RMX, Apple Loops, ACIDized Wav and Reason ReFill. Pop Rock Guitars is organized into 16 song suites. Each suite has clearly labeled song parts (into, verse, chorus, bridge, etc.) with sustained chords for endings and breaks. All parts are also labeled by tone (clean, overdrive, distortion). Pop Rock Guitars has an "A" (Stratocaster), "B" (Les Paul) and "C" (Les Paul Special) guitar part for every song section, all performing distinct parts. Pop Rock Guitars presents a selection of "Toolbox" parts comprised of chromatic straight-ahead strummed 8th note power chord loops, chromatic major and minor sustained chords, and a range of slides. All toolbox loops are presented in the three tones that are used throughout the library. These are designed to supplement any suite or stand on their own as the backbone to any track. Using Pop Rock Guitars within Stylus RMX requires the user to drag-and-drop only one folder into RMX's included S.A.G.E. Converter. Pop Rock Guitars includes Stylus RMX multi patches that allow the user to automatically load the A, B and C parts of any suite. All loops are mono in 24-bit/44.1kHz resolution. For more information, visit www.NineVoltAudio.com. Image Line Announces Slicex v1.0.6 Image Line has announced that Slicex v1.0.6 is now available. Fxpansion BFD Cocktail Expansion Kit FXpansion presents the latest addition to the BFD2 Expansion Kit range: BFD Cocktail, a recording of a Yamaha Hipgig portable drumkit. DanceMidiSamples DMS Dimension DanceMIDISamples has announced the release of DMS Dimension, a new VST instrument ROMpler for Windows aimed at trance producers.